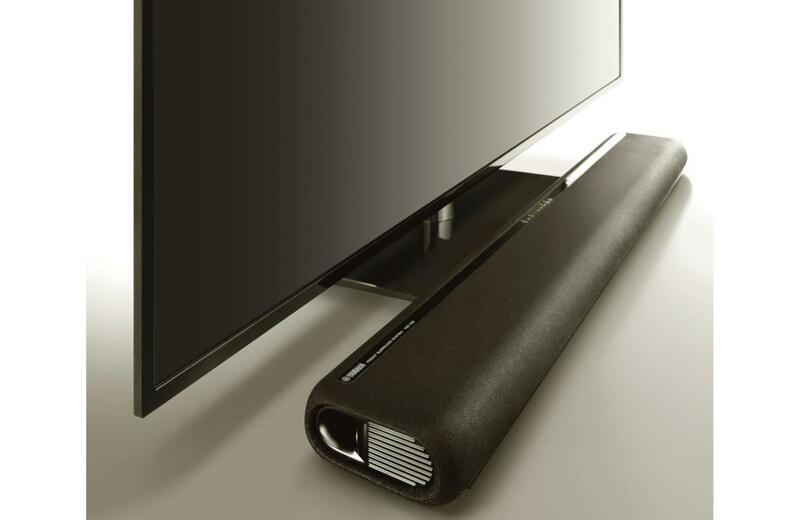 This powerful, low-profile soundbar won't wow you with its feature set, but it will bring a solid sonic upgrade to your TV experience. This speaker doesn’t have a long list of features, but it sounds great and it’s equipped with HDMI in and out with 4K UHD HDR (high dynamic range) pass-through and HDCP 2.2 copy protection support. Those are features you won’t see on many of its competitors. The YAS-106 also has an optical digital input and a 1/8-inch analog stereo input. Yamaha provides a Toslink cable for the former and a 1/8-inch-to-stereo-RCA adapter for the latter. You’re on your own when it comes to HDMI cables, but its HDMI out does support ARC (Audio Return Channel). You’ll find a pair of 1-inch dome tweeters inside, along with two 2 1/8-inch midrange drivers driven by a 30-watt amplifier. A discrete 60-watt amp drives a pair of 3-inch cone subwoofers. Ports at each end help enhance its low-end frequency response. Yamaha doesn’t include a subwoofer with this package, but it does provide a preamp subwoofer output should you want to add one. 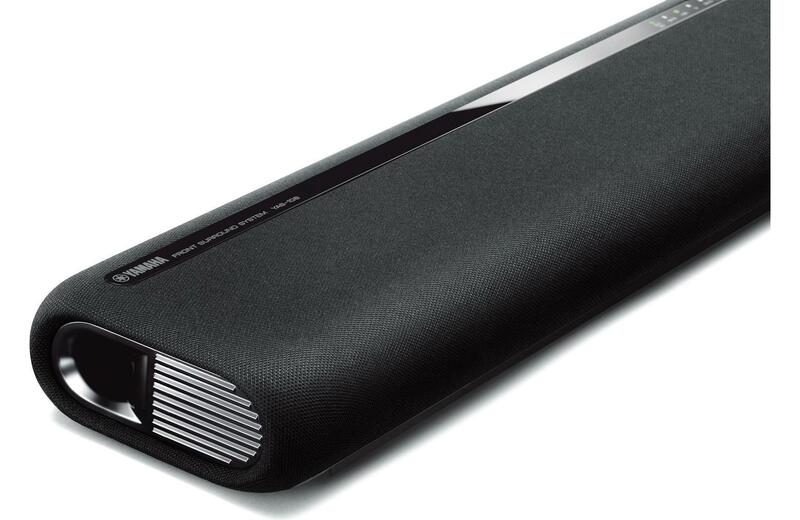 Yamaha’s YAS-106 soundbar makes a good companion to smaller flat-screen displays. Measuring 35 inches wide, it’s a good match for smaller TVs. Its 2 1/8-inch profile is unlikely to block your TV’s infrared receiver if placed in front of your TV, and its 7.1-pound weight makes it easy to hang below a wall-mounted TV. Yamaha’s remote is functional but basic—and preordained to get lost in your couch cushions because of its credit-card-like form factor. And since its buttons aren’t backlit, you won’t be able to use it in a darkened room—such as a home theater. But hey, what do you want for $200? The remote is at least logically laid out, and the most important buttons—such as volume control—have unique shapes so you can locate them by touch. There are also dedicated buttons for stereo and surround mode to help you switch between the soundbar’s two primary settings. Install Yamaha’s free Home Theater Controller app on your smartphone or tablet, however, and you just might leave the physical remote in a drawer. The app connects to the soundbar via Bluetooth and displays the currently active input; the surround DSP mode you’re listening to; Clear Voice, bass, and subwoofer volume levels; and more. Yamaha also supports a third remote control option, CEC (Consumer Electronics Control), that enables you to use a single remote to control multiple devices connected via HDMI (it’s part of the HDMI spec). Many manufacturers assign proprietary names to their CEC implementations (which can be confusing), and some leave the feature turned off by default (which can be aggravating). In theory, CEC allows you to use your existing TV remote to turn the YAS-106 off and on control, control its volume and input/output selection. In practice, CEC can be quirky, so your mileage may vary. Yamaha provides the most essential inputs and outputs you'll need for a basic home theater installation. I connected the Yamaha soundbar on a 29.5-inch-tall table directly over the center-channel speaker in my home theater and in front of my older Sony 52-inch HDTV, which I used as a reference. Even though it’s about 11 years old, the Sony has a substantive speaker section. I then fired up Rogue One: A Star Wars Story and did A/B comparisons between the YAS-106 and the TV. The differences were immediately apparent: The soundbar delivered a greater sense of depth to the movie’s presentation, and it was easier to hear the all-important dialog. During scenes between Grand Moff Tarkin and Orson Krennic discussing the Death Star, I engaged the Yamaha’s Clear Voice feature, which provided a noticeable boost in the vocal range. While the effect wasn’t completely natural, it was definitely effective at bringing dialog to the forefront. Engaging the Movie surround mode expanded the front soundstage and provided some additional bass boost. It’s effective with action movies, but didn't care for it with other content. If you want good deep bass, you’ll want to connect a dedicated powered subwoofer to the YAS-106. 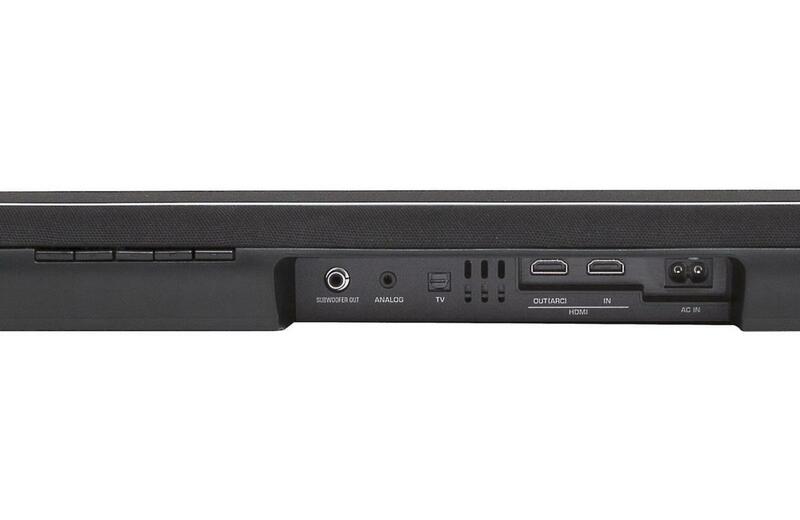 The YAS-106 has side ports for its internal bass drivers. Yamaha's surround mode isn’t intended to simulate a 5.1- or 7.1-channel surround system, so don’t be confused by the terminology. You won’t come close to experiencing the enveloping effect of discrete surround speakers, but the effect is not unpleasant or distracting. I streamed music via Bluetooth to the Yamaha AST-106 flawlessly. I was able to get close to the 33-foot wireless range thanks to the open setup in my room. If you have walls or other obstructions, your wireless range will be less. And music over Bluetooth was a satisfying experience. I played up “Sister Rosetta Goes Before Us,” from the Robert Plant and Alison Krauss album Raising Sand, and concluded that Krauss’ vocals were good and the instruments well defined, but the song came across slightly veiled. I had a better experience with its performance of Yo-Yo Ma Plays Ennio Morricone. The YAS-106 is an entry-level soundbar, but it did a fine job of calling up the emotive qualities of that simply blissful album. I wouldn't care to endure long critical listening sessions with this speaker at high volume, though; my ears became fatigued after a while. Yamaha’s YAS-106 is a simple, no-frills soundbar, but it's also a major upgrade over just about any TV's built-in sound. HDMI in and out makes it super easy to set up, and the results are well worth the time and money. Yamaha’s Clear Voice technology makes movie and TV dialog easier to hear, and while this speaker doesn't have network connectivity, Bluetooth music streaming is easy and enjoyable. And if you find you can't live without a subwoofer, you can connect any model to the YAS-106's preamp subwoofer out. Getting all that for $200 is a top value. Yamaha's YAS-106 makes up in audio performance what it lacks in features.